Here in Bellingham, it works if one has a clear view toward the mountains north of Vancouver, BC. I get 4 digital TV stations from Vancouver. Bellingham also has 2 commercial channels from the top of Orcas. 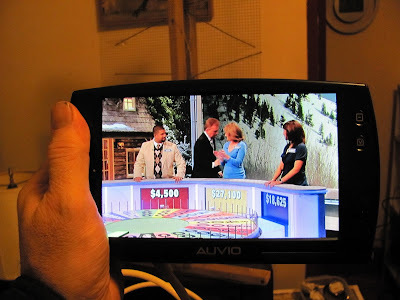 KVOS, Channel 12 and a shopping channel called KBCB. Out of Vancouver, there are 3 commercial stations and the CBC (Canadian National Broadcasting Network). I like CBC Radio, so now I get CBC TV. Why bother? It's mostly all on the web anyway. Just thought I'd try out my handiwork and see if I could follow the instructions. I haven't watched TV, but now maybe I'll watch some. There's good instructions on a web site found from Google search. Make your own antenna with things many folks have around the house, like coat hangers and aluminium foil. It works, only I used chicken wire instead of aluminium foil. I happened to have some and it's less apt to tear. Still provides the reflective background for TV signal. 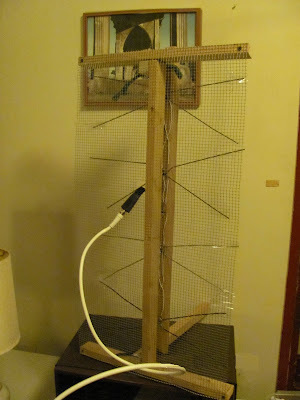 Also, on my version of the antenna, the coat hanger elements can be moved closer or farther from the chicken wire. Don't know if that helps or not. It's strapped together with bungee cord and can slide back and forth along two dowels that are perpendicular to the chicken wire square. Most of the time, I listen to radio and use the Internet. Making the antenna might be more interesting than what's on TV, most of the time. At least it's something to do. Now I can watch a bit of TV and not pay for cable which is not common in Bellingham. Almost all of Bellingham is on cable. We are behind the Chuckanut Mountains from Seattle TV signals. My Internet comes from the telephone lines via DSL. Nothing against cable, but I also don't watch much TV. From Vancouver, I can get digital signals from CBUT (CBC), CHAN, CHNM and CIVT. Also Bellingham's KVOS and a shopping channel.